Tasty Tandoori Grilled Chicken with a Twist – Subtle Indian flavours accented with a fresh peach salsa. A perfect meal for the whole family. Dairy products have always played an important part in our family’s everyday cooking and eating habits, as they have for a number of Canadians. From pizza to cheesecake to the cream in your morning coffee, it’s hard to think of a more versatile, delicious or nutritious food group, that’s part of a balanced, healthy-eating lifestyle. Hard working dairy farmers across the country bring us these delicious foods & recipe ingredients every day, and for the last 41 years, have also brought us an annual tradition, their yearly Milk Calendar. Tasty Tandoori Grilled Chicken with a Twist ingredients for marinade. This fall, the 2018 Milk Calendar by Dairy Farmers of Canada is making its way into the homes of close to 2 million people in Ontario and Atlantic Canada. I was lucky enough to get a preview copy and it is chock full of 19 recipes that focus on local sustainable foods and the goodness of 100% Canadian Milk. I was asked to share with you an incredibly tasty dish, featured this July in the calendar. Surely, I must have been given this recipe to highlight because of my well established love of my back yard grill, and my never ending obsession with fresh summer peaches. There certainly are no shortage of peach recipes, grilling recipes or Indian cuisine inspired recipes on this blog. This beautifully presented, tandoori spiced and yogurt marinated grilled chicken with peach salsa was perfectly suited to our family’s tastes! Included with the 19 delicious recipes in the Milk Calendar are valuable cooking & entertaining tips, creative recipe variations, as well as helpful food pairings. Be sure to visit MilkCalendar.ca to find out how to get your own copy, plus find more videos and cooking tips to help your family cook better together. I’ve long advocated getting the whole family involved in meal planning and preparation, as the best way of developing valuable skills and encouraging healthy eating habits. This year’s Milk Calendar is a great resource for doing just that. Tasty Tandoori Grilled Chicken with a Twist ingredients for peach salsa. Rock Recipes is pleased to have Dairy Farmers of Canada as sponsor of this recipe post. Both product and compensation were provided by the sponsor. All opinions expressed here are strictly my own. In a medium bowl, stir yogurt with garam masala, turmeric, garlic, ginger, salt and pepper. Place chicken in a dish just large enough to hold it. 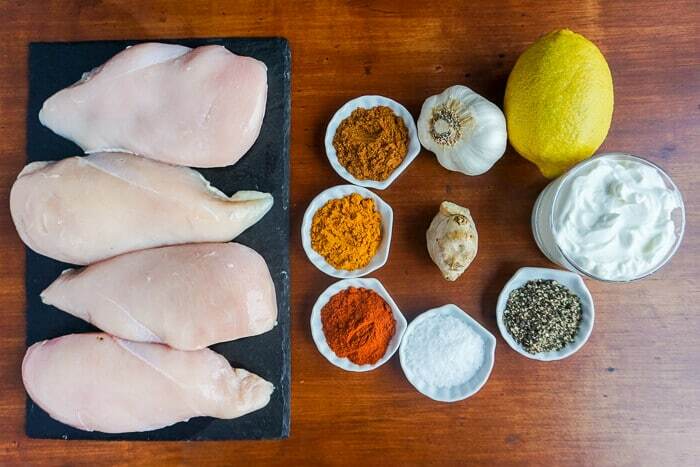 Using a sharp knife, make a few shallow slashes in each piece of chicken to allow marinade to penetrate. Sprinkle with salt and cayenne. Sprinkle lemon juice over chicken, trying to get it into slashes. Pour yogurt marinade over chicken, turning to coat. Cover, refrigerate and marinate for at least 2 hours, but preferably overnight. 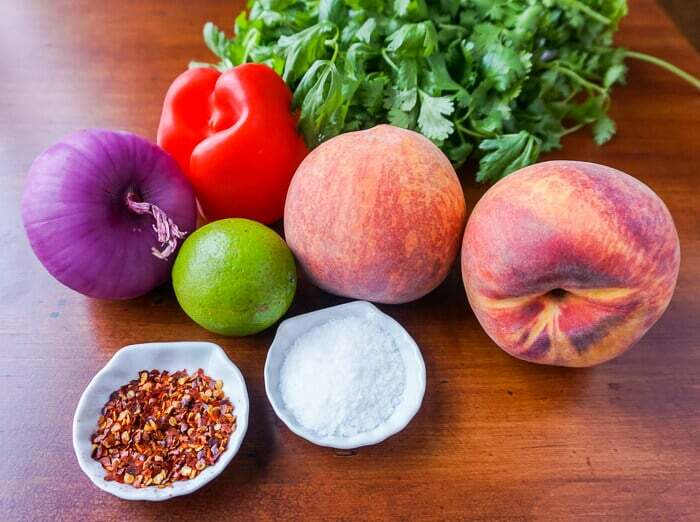 Place chopped peaches in a bowl along with red pepper, onion, chili flakes and salt; stir. Add lime juice and coriander. Refrigerate if not using right away. Grease grill and preheat barbecue to medium-high. Remove chicken from yogurt mixture, leaving any yogurt clinging to it. Place on grill. Barbecue for 10 to 13 min, turning occasionally, brushing frequently with leftover marinade and moving to a cooler side of grill if needed, until chicken is cooked through. Allow an additional 2 hours for marinating time. This tandoori chicken was super!